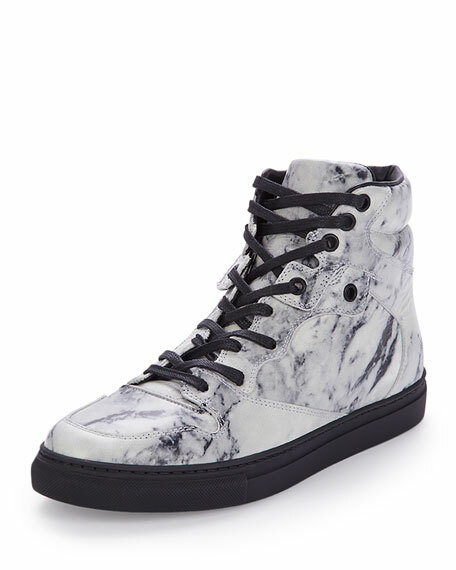 Balenciaga marbled leather high-top sneaker. The first Cristobal Balenciaga house of haute couture was founded in 1919 in San Sebastian, Spain. By 1937, Paris became home to the famed couturier. In 1946, the House of Balenciaga launched its first perfume, and soon it attracted the same acclaim as the famous Balenciaga couture pieces, which are today under the skillful guidance of Creative Director Alexander Wang. For in-store inquiries, use sku #1649114.